Police are anticipating a possible retaliation by communist rebels for the death of National Democratic Front consultant Randy Malayao, who was shot dead in a parked bus Wednesday. 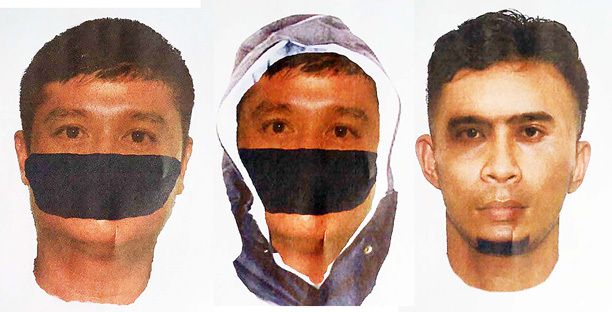 Police released these computerized composite portaits of NDF consultant Randy Malayao’s alleged assassins on Friday. Chief Inspector Rex Pascua, Chief of Police of Jones town in Isabela province, said Friday they expect rebels from the Benito Tesorio Command or NPA South Front to attack government forces and outposts to avenge Malayao, whose remains were taken back to his hometown in San Pablo, Isabela on Thursday. Pascua said police would put up check points along the interior roads of Isabela’s towns and ask for identification from passersby in a bid to thwart the Tesorio rebels, who claimed responsibility for an ambush that killed two Army soldiers in Gamu town two years ago. “We will remain alert and keep our men on the ground. In fact, we had intensified our guard and alerted our assets,” the police chief said, noting that Jones town has already been declared an election hot spot by the Commission on Elections. This developed as Philippine National Police chief Oscar Albayalde has relieved two police officials in Nueva Vizcaya for procedural lapses in investigating the murder of the NDF consultant. Reports said Chief Insp. Geovanni Cejes, chief of the Aritao municipal police station, had passed on Malayao’s laptop and cell phone to the victim’s relatives without having them examined first by forensic investigators. Also sacked was Sr. Supt. Jeremias Aglugub, provincial police director for Nueva Viscaya. The NDF consultant was seated alone inside the Victory Liner bus during a stopover at the Aritao bus terminal at 2:30 a.m. when two assailants on a motorcycle disembarked and entered the bus and shot the sleeping victim in the head at close range. Malayao died on the spot and suspects fled south on their Yamaha Mio motorcycle. PNP spokesman Sr. Bernard Banac said Albayalde has already directed Chief Supt. Jose Mario Espino, director of Region II to designate replacements for the sacked officials. The provincial police office released composite sketches of the two suspects in Malayao’s killing. Based on the description of witnesses, the gunman, who was wearing a hoodie and a face mask, was 5’4” to 5’6” tall, of medium build, had fair complexion, and was between 25 and 30 years old. The other suspect, who drove the motorcycle, was wearing a yellow shirt and brown shorts, of slight build and fair complexion, and was 5’3” to 5’6” tall. He was said to be between 20 to 25 years old. Malayao was on his way back to his hometown in San Pablo, Isabela from Manila when the attack took place. He had attended peace negotiations in Europe as a consultant from Cagayan Valley before peace talks were cancelled. He also acted as one of the spokespersons of the National Democratic Front negotiating panel in Europe. He represented the NDF in peace forums abroad and in the country. A former political prisoner, Malayao spent more than four years in jails in Cagayan and Isabela provinces and was freed after he had been acquitted of the charges against him. He also denounced allegations that Malayao was killed by the communist New People’s Army. “It is a brazen intrigue of the vilest kind…with a malicious purpose to cover up the criminal responsibility of the murdering agents of the Duterte regime,” he told ABS-CBN.